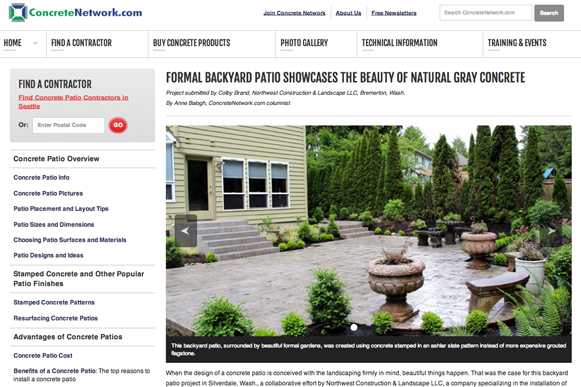 Over the previous week, one of our concrete projects was featured on the home page of ConcreteNetwork.com. This site is the go-to resource for homeowners and concrete contractors all over the country, offering the latest in trends, products and training. As a small business and landscaping company based in Kitsap County, naturally, we were very excited when we heard the news! Read the full article below, or click here to read it on ConcreteNetwork.com. “When the design of a concrete patio is conceived with the landscaping firmly in mind, beautiful things happen. That was the case for this backyard patio project in Silverdale, Wash., a collaborative effort by Northwest Construction & Landscape LLC, a company specializing in the installation of stamped concrete patios, driveways and walkways, and landscape architect Emily Russell of Russell Design Source, the designer of the formal backyard garden. The goal of the project was to totally transform the backyard by reducing the lawn area, much of which was saturated and mossy, and better utilize the space by creating a courtyard patio that that the homeowner could use for family gatherings, entertaining and relaxation. Because of budget concerns, the homeowner opted for decorative stamped concrete rather than a mortared flagstone patio, saving more than $5,000. “I always let homeowners know that we can do either for them, but to me, going with concrete is an easy choice to make because of the cost savings,” says Colby Brand, president of Northwest Construction & Landscape. In addition to the stamped concrete patio, the project included concrete steps to allow a smooth and easy transition from the inside of the house to the outside and a curved concrete walkway on the side of the house to connect the backyard to the front yard. Brand suggested using an ashlar slate pattern for the entire project to mimic the pattern used in Russell’s conceptual design. To more closely replicate the look of flagstone, the concrete was left a natural gray with antiquing color added for greater realism. The shape of the 647-square-foot courtyard patio was designed to enhance the formal landscape plans. Instead of a conventional rectangular shape, sections of the concrete bump out into the garden beds against the backside of the house to tie the various elements together.